The'must have' and highly desirable Xmas gift this year! No further stock before Xmas. 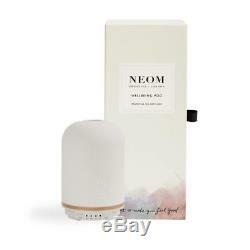 You are purchasing a genuine brand new, boxed and unopened Neom Wellbeing Pod Essential Oil Diffuser. You select your choice separately from Neom. Delivers the perfect amount of scent in minutes. At the touch of a button you can achieve better sleep, less stress, more energy or a mood lift. The Pod along with our Essential Oil Blends, lets you easily switch your scent to suit your wellbeing need. Features a low energy LED light and a timer as well as humidifying the air around you. Fill the water tank with cold water. Do not exceed the maximum water level line. Add up to 10 drops of your chosen Neom Wellbeing Essential Oil Blend. With the touch of a button, it will instantly release a heatless, fine mist of scented vapour into the atmosphere to simulate your senses and boost your wellbeing. If your wellbeing need changes, simply empty the pod, switch your scent and repeat. The Pod is equipped with low energy LED lights and a night light making it perfect for both day and night. It has a timer with settings for continuous, one, two and three hours. Humidifies the air around you whilst transforming your home with natural scent. The Pod is 92mm wide x 143mm high. The Pod is mains operated not battery operated. The pod comes with multi use adaptors for the following countries (Europe, US, Taiwan, ME, Japan, HK, Singapore, China, UK). The item "BRAND NEW BOX NEOM ORGANICS LONDON WELLBEING POD ESSENTIAL OIL DIFFUSER SOLD OUT" is in sale since Thursday, December 13, 2018. 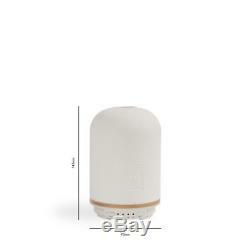 This item is in the category "Home, Furniture & DIY\Home Decor\Home Fragrances\Oil Burners". The seller is "something_special2009" and is located in bristol. This item can be shipped to United Kingdom, Austria, Belgium, Bulgaria, Croatia, Cyprus, Czech republic, Denmark, Estonia, Finland, France, Germany, Greece, Hungary, Ireland, Italy, Latvia, Lithuania, Luxembourg, Malta, Netherlands, Poland, Portugal, Romania, Slovakia, Slovenia, Spain, Sweden, Australia, United States, Canada, Japan, New Zealand, China, Israel, Hong Kong, Norway, Indonesia, Malaysia, Mexico, Singapore, South Korea, Switzerland, Taiwan, Thailand.